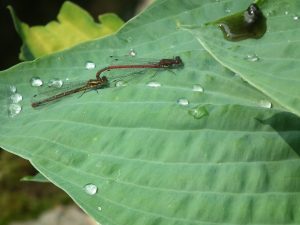 Belonging to the same family as the Dragonfly, a mating pair form a shape known as a “heart” or “wheel”, the male clasping the female at the back of the head, the female curling her abdomen down to pick up sperm from secondary genitalia at the base of the male’s abdomen. 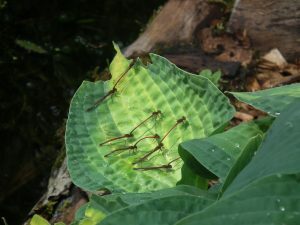 The pair often remain together with the male still clasping the female while she lays eggs within the tissue of plants in or near water using an ovipositor. Alongside the pond are some Hostas like the ones in the picture above and below which make for excellent landing and egg laying sites.